IT’S been 106 years since the Titanic sunk after striking an iceberg in the Atlantic Ocean. And now a hotel with strong links to the tragedy is due to reopen after a huge £85 million refurbishment – a day after the anniversary of the sinking of the ship.The former Hotel Russell in London’s Bloomsbury has been renamed Principal London, and reopens its doors on on April 16. The Grade II listed building was designed by Charles Fitzroy Doll in 1898, and the ornate dining room on board the Titanic, also designed by him, is said to be a replica of the hotel’s. 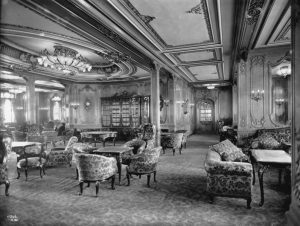 Several passengers on the ship also stayed at the hotel before they set sail on the Titanic from Southampton. There’s also a bronze dragon in the hotel that’s the twin of one that went down on the ship. Among them was Everett Edward Elliott, who lived in Wilmington Street, Clerkenwell. At only 24 years of age, he signed on as a trimmer on April 10, 1912, on the morning the Titanic left Southampton. His body, recovered by rescue ship Mackay-Bennett, lies in Halifax municipal cemetery. It’s a striking sight, for sure, but then again, just beyond it is a massive castle, an inn where it’s Christmas year-round, and a towering King Kong climbing a cartoonish copy of the Empire State Building. No, I’m not tripping. This is Pigeon Forge, TN, home to Dollywood, wax museums, and every kind of tourist attraction imaginable — but I’ve got my sights set on the unsinkable ship that, tragically, sank more than 100 years ago. There’s a secret dining room inside that serves a three-course meal worthy of the White Star Line, but only for groups of 35 or more.